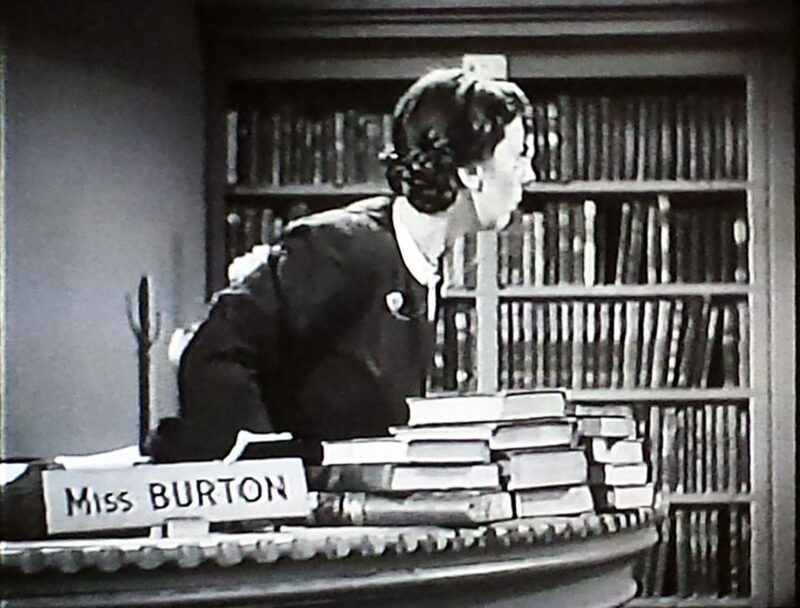 A typical reel library set, complete with stereotypical “spinster librarian” in residence. 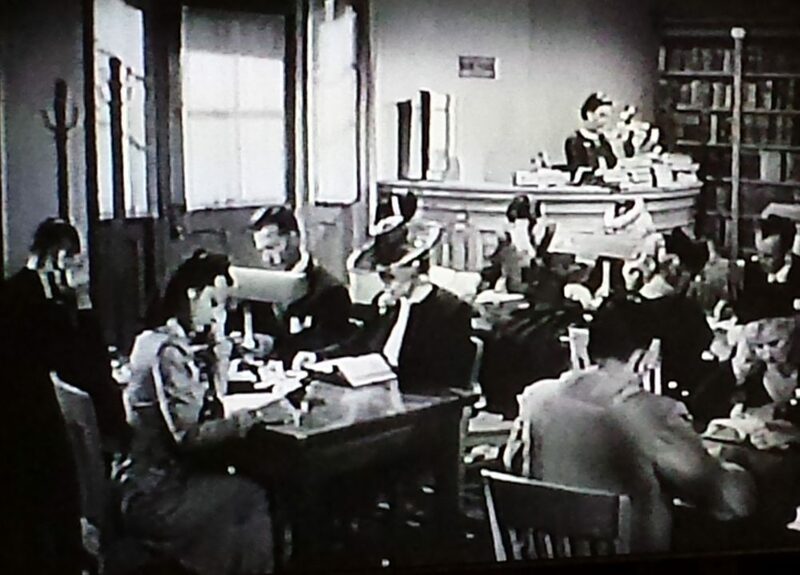 In the 1946 film Boston Blackie and the Law, reformed thief Blackie performs a magic show in a women’s prison, and one of the inmates, Dinah, escapes during the “disappearing booth” trick. Turns out Dinah was a former magician’s assistant! D’oh! First things first… who’s “Boston Blackie”? This film was one of the last in a series of films featuring “Boston Blackie,” a reformed crook who became an amateur detective. Jack Boyle started writing short stories about “Boston Blackie” in 1914, and the stories were published as a collection in 1919. There were a series of silent films as well as a series of popular talkies in the 1940s starring Chester Morris as Blackie. 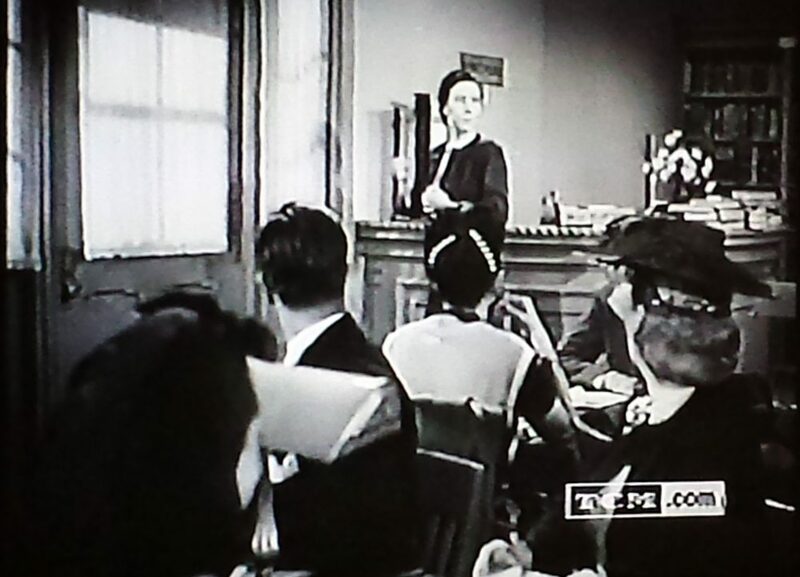 There was even a TV series in the 1950s! You can read all about it — and more! — here at the Boston Blackie website. After Dinah’s disappearance at the prison, the police interrogate Blackie back at police headquarters, who manages to escape police custody. From a public phone booth, he then calls a friend and urges him to “drop everything and meet me at the Reading Room of the uptown public library. Right away.” The police find out and tail him there. After reading up on Dinah — who turns out to have been involved in a robbery that netted $100,000 that was never recovered! — Blackie and his friend escape out a side door when two police detectives enter the library. 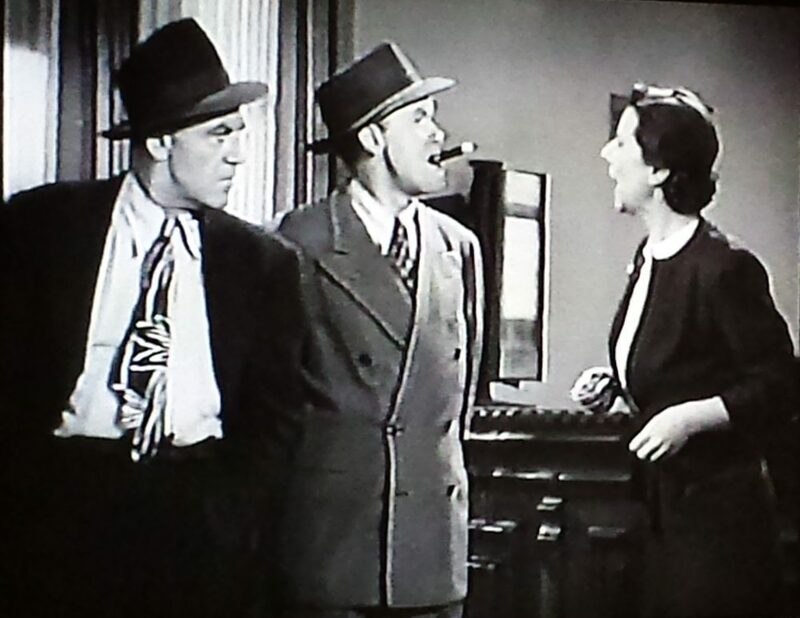 The detectives are smoking cigars and talking loudly. And guess what happens? The librarian is LIVID at this spectacle — and even gets out of her chair to admonish the two detectives, up close and personal. 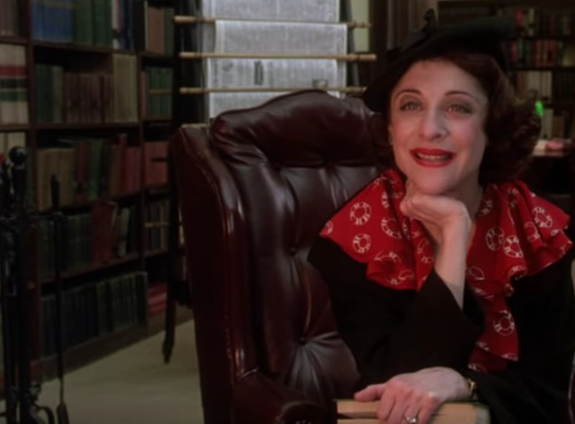 Miss Burton: Young man, this is a library where people are trying to think. Detective: Lady, we ain’t here to think. The reel librarian breaks her own rules! 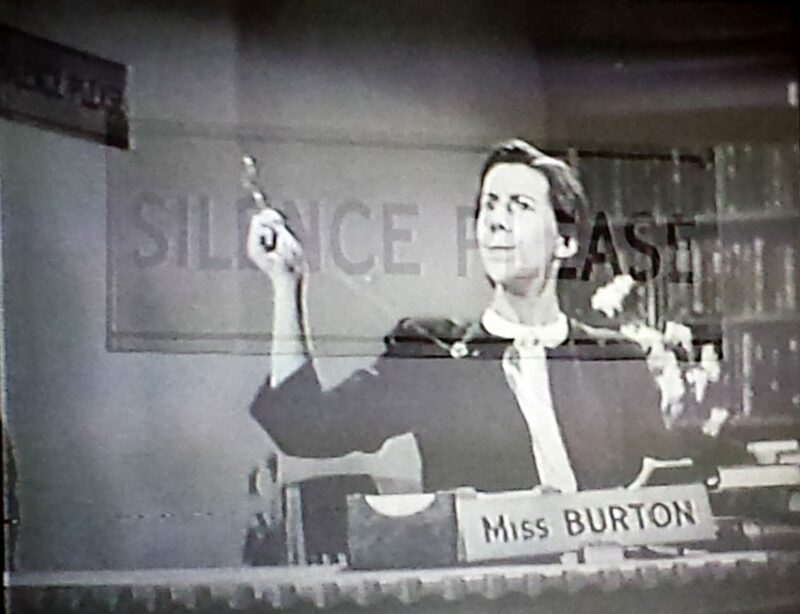 Maudie Prickett is uncredited as Miss Burton, the reel librarian. 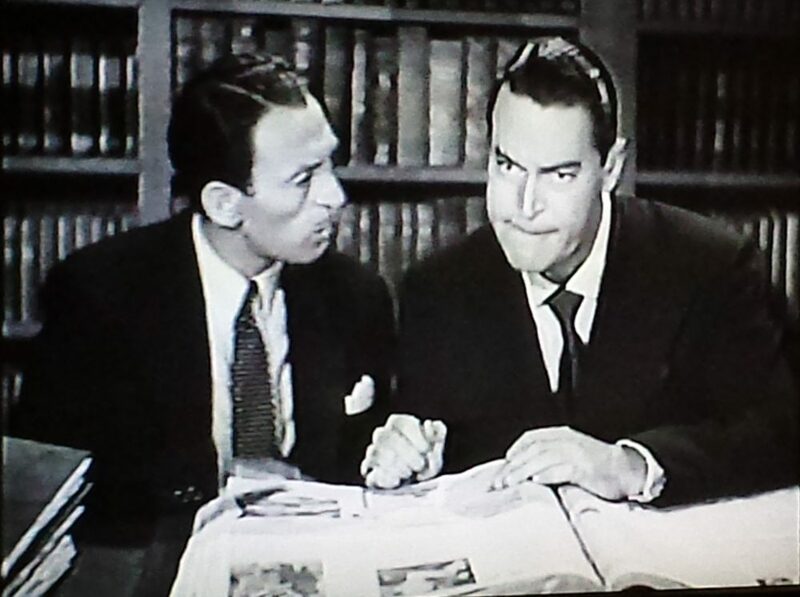 It is amusing to note how the librarian and the chief detective both look each other up and down in mutual disgust. Two worlds — and two worlds with their own set of rules! — colliding, to be sure. 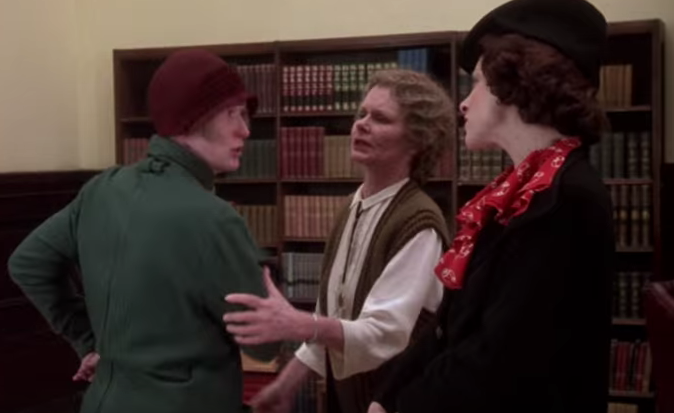 The entire library scene is played for laughs, and the humor is quite crude. I’ve categorized this film in the Class III category. 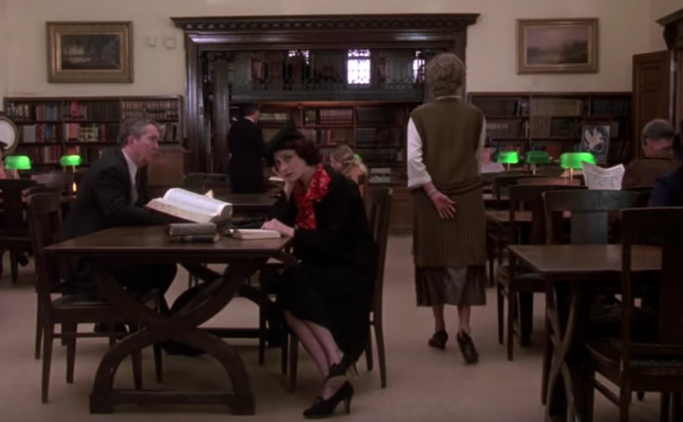 The scene is quite short, only lasting about three minutes, but the portrayal of the reel librarian is quite memorable (if for all the wrong reasons). 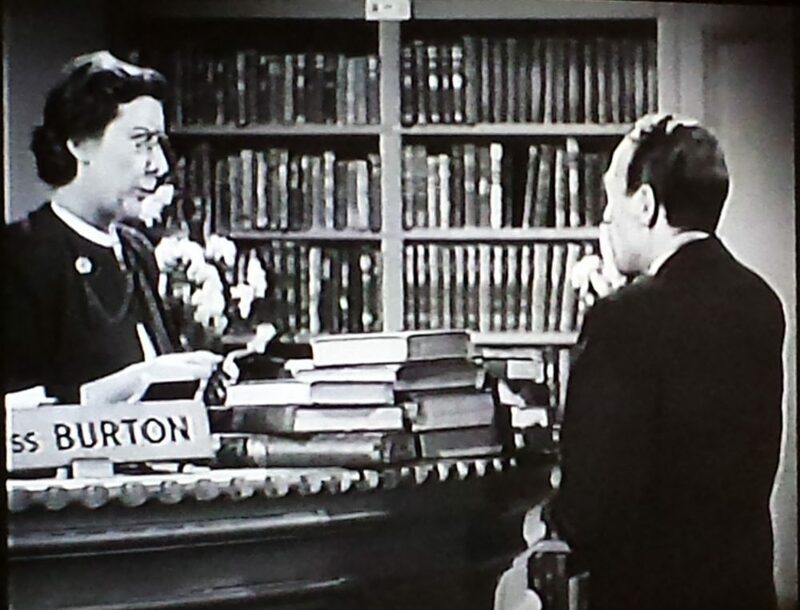 The reel librarian in Boston Blackie and the Law doesn’t actually help in any way — Blackie does that himself — and her only function seems to be stamping books and shushing people. She is most definitely a Spinster Librarian character type, a minor character who is an uptight “old maid” and rule-monger who hoards information. She is all about the rules — and woe unto anyone who breaks those rules — even if it’s herself! Boston Blackie and the Law. Dir. D. Ross Lederman. Perf. Chester Morris, Trudy Marshall, Constance Dowling. Columbia Pictures, 1946. 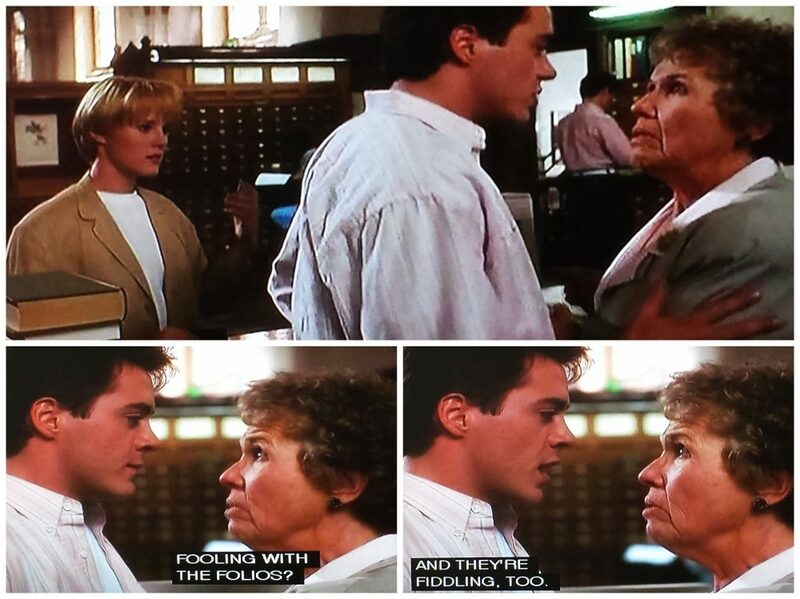 The movie Chances Are (1989) is a romantic comedy about reincarnation. A woman’s (Cybill Shepherd) husband is killed in the 1960s, and in a brief heaven scene — complete with fluffy clouds and angels with clear tablets shaped like the Ten Commandments — we see the husband head off to get reincarnated. The only problem is, he doesn’t get the all-important forgetfulness inoculation. Through the rest of the film, Corinne (Shepherd) believes her husband’s soul has come back in the body of her daughter’s boyfriend, Alex (Robert Downey, Jr.). As you can imagine, the creep factor is quite high in this film. If Alex is Corinne’s reincarnated husband, then he’s dating his own daughter. If he’s not her reincarnated husband, then Corinne is stealing her daughter’s boyfriend. Oh, and she’s been cooking her dead husband dinners for over 20 years. And her husband’s best friend (Ryan O’Neal) has been in love with Corinne all this time, and has basically helped raised Corinne’s daughter. Like I said, the creep factor is high. It’s a strange premise for a romantic comedy, and it requires a good half-hour or so of set-up and character introductions. 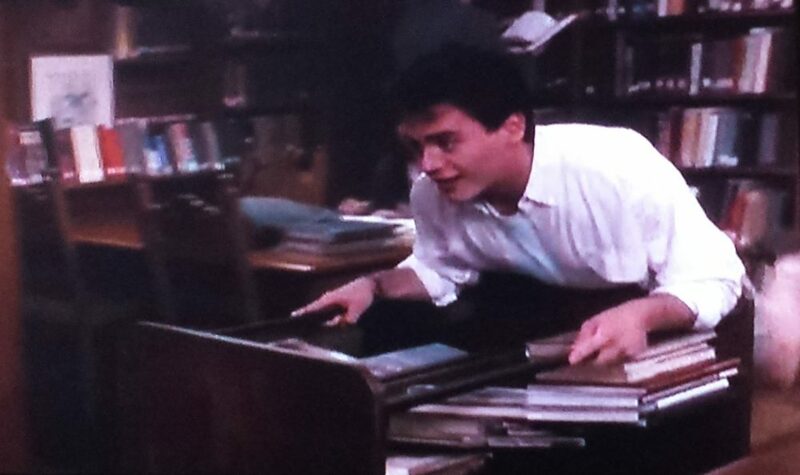 The first time we meet Alex is about fifteen minutes into the film, as he coasts along on a book cart in the Yale University Library. This introduces his personality as boyish and fun-loving — traits at odds in a serious setting like the library. 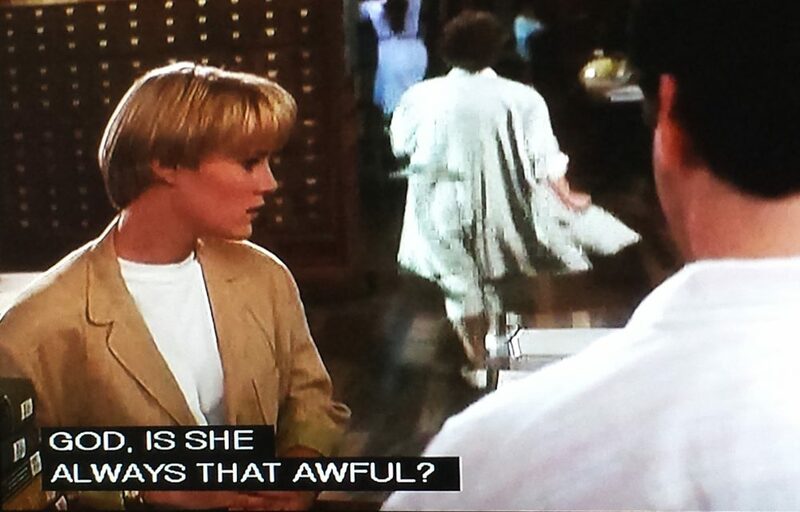 He then coasts into a scene in which Miranda (Masterson) — whom is later revealed to be Corinne’s daughter — is getting schooled by a librarian called Mrs. Handy (Kathleen Freeman). The librarian is middle-aged, dressed in conservative layers and has short hair — but no glasses! Mrs. Handy: So you just assumed that nobody at Yale University or Yale Law School had any interest in checking out these 6 books in the last 3 months? You are going to make some lawyer. You owe $87.25. Miranda: Can I put that on a credit card? Mrs. Handy: This isn’t a boutique. Cash only, or we’re have to hold up your grades. Look at that old computer! Alex then swoops into action, coming to the rescue of the damsel in distress. Alex: Mrs. Handy. The rare books room. The Shakespeare folios. Mrs. Handy: Fooling with the folios? Alex: Yes and they’re fiddling, too. Go! Fiddling with the folios? Horrors! Miranda’s reaction as the librarian rushes off? God. Is she always that awful? Uh-oh. This is bad. Worse than I thought. According to this, these books were never legally checked out. So that means I can’t charge you for them. You beat the system. Alex then introduces himself, and we learn that he’s about to graduate. Miranda rushes off — she’s got a ride waiting, because she just had NO IDEA that it would take very long to return books that were 3 months overdue — but doublechecks that the “awful” librarian isn’t his mother. Your library fines total $87.25. You checked out 6 books, which are 3 months overdue. What then is the daily rate for library fines? 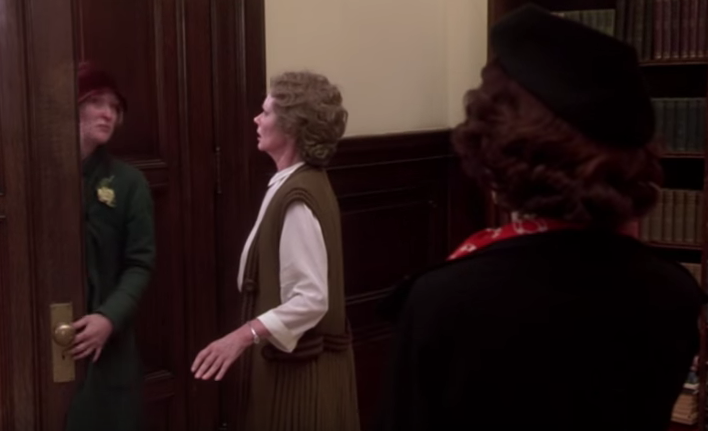 This “meet cute” introductory scene also recalls the “meet cute” scene in the 1970 film Love Story, co-starring Ali MacGraw and Ryan O’Neal, one of the four leads in Chances Are. 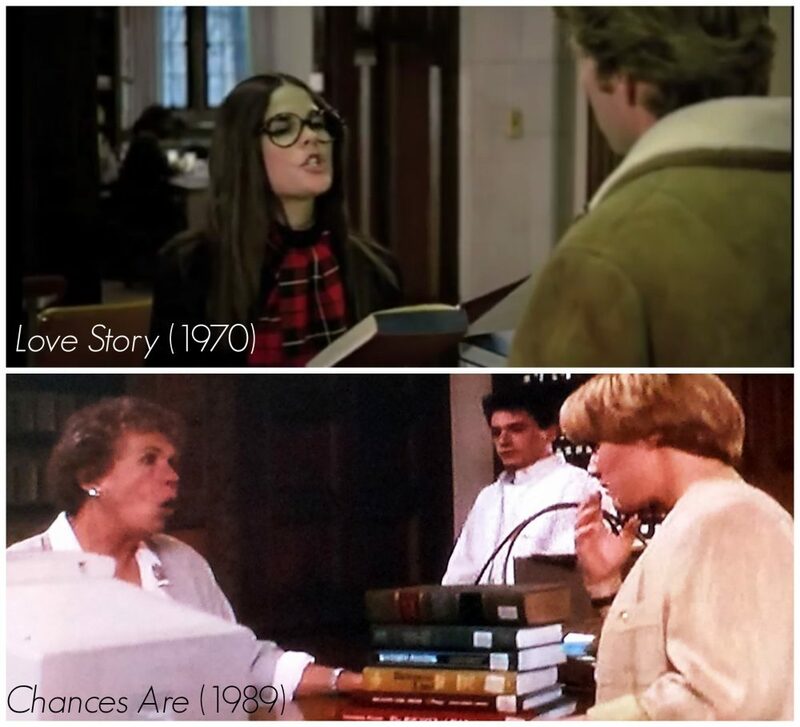 In Love Story, Ali MacGraw plays a library assistant and is the one who schools Ryan O’Neal. And in yet another coincidence, Robert Downey, Jr. starred in another reincarnation comedy a few years later, in the 1993 comedy Heart and Souls. That film also included a reel librarian character, a supporting character named Harrison Winslow, played by Charles Grodin. Harrison in Heart and Souls turns out to be a Liberated Librarian — as does Alex in Chances Are. The librarian, Mrs. Handy, definitely fulfills the Comic Relief role in this Class II film. For more examples of Comic Relief portrayals, click here. And for more about Liberated Librarians, click here and here. Chances Are. Dir. Emile Ardolino. Perf. Cybill Shepherd, Robert Downey, Jr., Ryan O’Neal, Mary Stuart Masterson, Christopher McDonald. TriStar, 1989. Heart and Souls. Dir. Ron Underwood. Perf. Robert Downey, Jr., Charles Grodin, Alfre Woodard, Kyra Sedgwick, Tom Sizemore, Elisabeth Shue. Universal, 1993. 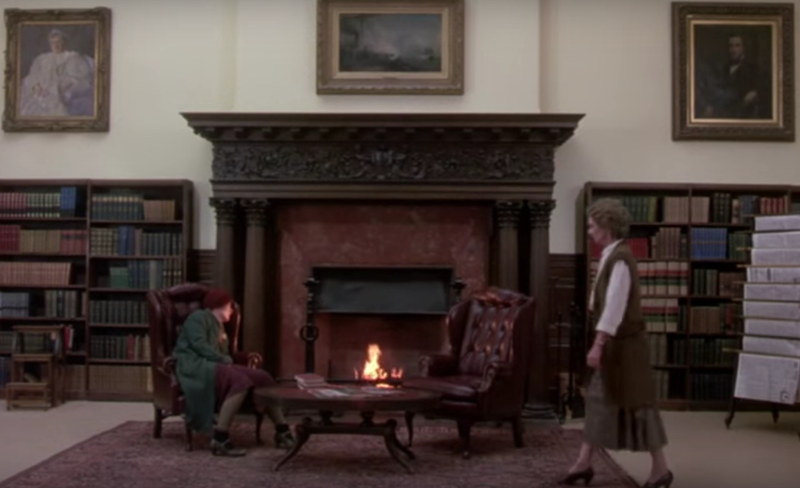 There are two library/archives scenes in this TV film, and both scenes involve two Information Providers: one restrictive and focused on rules (the rule-monger) and the other obliging and helpful (the rule-breaker, or rather, rule-bender). 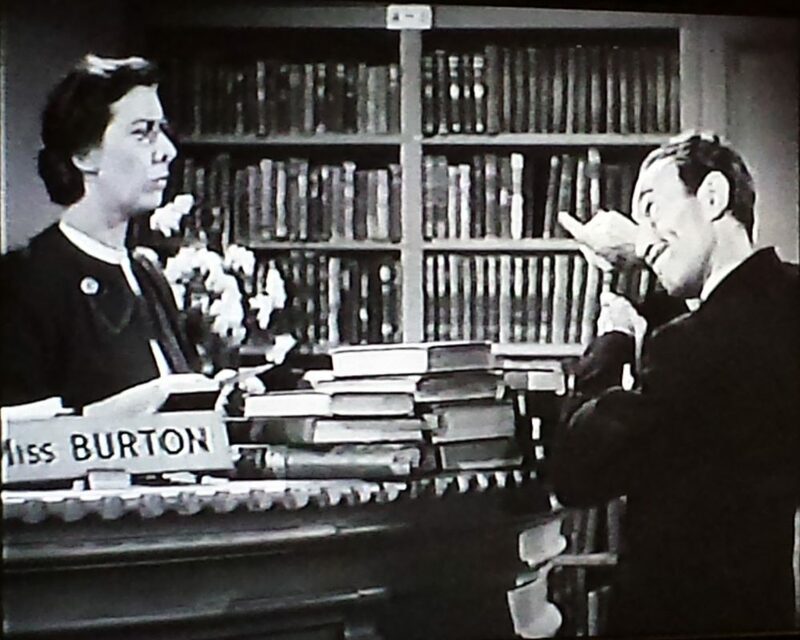 In the first scene early in the film, the rule-monger is the Older Librarian; in the second scene, the younger Clerk tries to crack that whip. And in both cases, the rule-benders prevail. Hmmm…. Both scenes are also pivotal in propelling the plot forward, as the rule-bending librarian/archivist provides a crucial bit of info. One scene is set in a massive state library in Russia, while the other takes place in a humble, small-town archives room. Set during the Vietnam War, a young pilot questions bombing missions after his partner is killed. In one short scene, a young officer in the ship’s library allows the pilot to check out a non-circulating issue of National Geographic (rule-breaker!) that contains maps of North Vietnam. 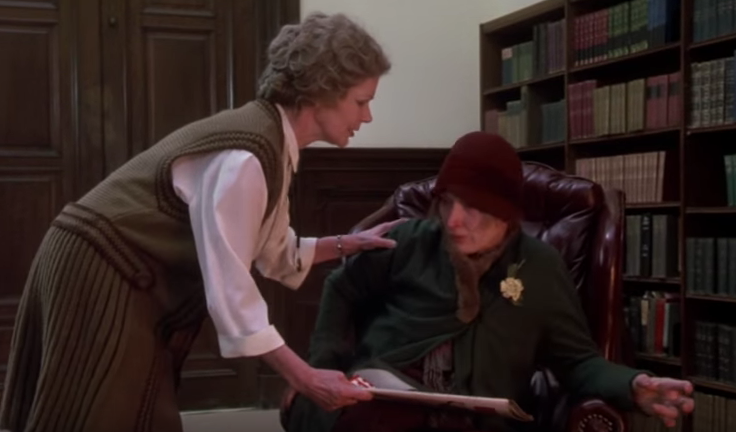 The reel librarian in this film, Miss Gottschalk (Sarah Shelby in an uncredited role), is in only one scene that lasts under a minute. But in that minute, she sells her soul for a few cheap compliments and half-hearted flirting, breaking the rules to provide a random male patron with restricted book culled from the private records of library patrons. 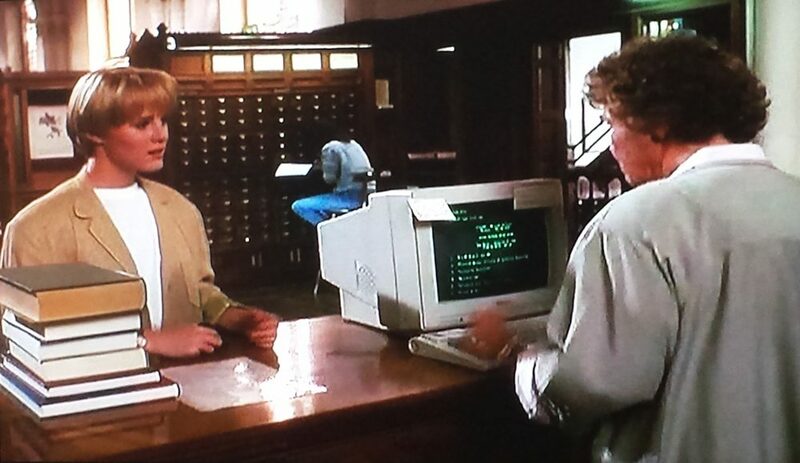 This portrayal also has the distinction of being in the first horror film to feature a reel librarians. And, of course, there are the reel librarians who are determined to punish rule-breakers, such as our resident serial killer, Miss Sally, the title character in the horror film Chainsaw Sally (2004). Archangel (TV movie). Dir. Jon Jones. Perf. Daniel Craig, Ekaterina Rednikova, Gabriel Macht. BBC, 2005. Flight of the Intruder. Dir. John Milius. Perf. Danny Glover, Willem Dafoe, Brad Johnson, Rosanna Arquette. Paramount, 1991.